The Central Intelligence Agency or CIA is a government agency that appears in the Grand Theft Auto series. They appear in Grand Theft Auto III, Grand Theft Auto: Vice City and Grand Theft Auto: San Andreas. In the HD Universe, they are named the International Affairs Agency (IAA). In GTA III, their first appearance the CIA monitor the Shoreside Lift Bridge when Ray Machowski tries to flee the city by flight. They are also said to have an interest in the Cartel manufactured drug SPANK. Weapons include M-16s, and Micro-Uzis. They are portrayed as men with light skin, and dark clothes. These also appear as random pedestrians. In 1986, the setting of GTA Vice City, the CIA are presumed to have appeared and operated in Vice City. They are first seen in the mission Check Out At The Check In, where they provide protection to an unnamed man wearing a business suit and carrying a suitcase. Despite their best efforts to stop him, Tommy Vercetti successfully assassinates the man and steals the suitcase. He then delivers the case to the Downtown Ammu-Nation store, avoiding attacks from the CIA. The briefcase may be evidence brought into Vice City against Mr. Black. The CIA also appears in the mission Loose Ends, where they are doing a deal (possibly with drugs or as an exchange of evidence) with the Sharks gang on the roof of the Cherry Popper Ice Cream Factory. Unfortunately for the two parties, Tommy Vercetti again crashes the party, kills all of the CIA Agents and Sharks gangsters present and delivers the merchandise to Mr. Black. In GTA Vice City, the CIA wear black suits with white shitst, black ties and sunglasses. All the CIA agents are white. The weapons used by the CIA are Micro-SMGs, and MP5s. The CIA in GTA Vice City drive black Admirals and black Ponies. It is unknown if the men in black suits protecting Avery Carrington's Rival and the men in black suits protecting the Malibu Club are also members of the CIA although judging by their behaviour and weapons, they are not. The Black Admiral driven by the CIA in the missions Check Out At The Check In and Loose Ends. The Black Pony driven by the CIA. In 1992 they make another appearance when Carl Johnson attempts to obtain a package for Mike Toreno, and when he has to bomb a plane containing a consignment of land mines. While on board the Andromada plane they utter strange phrases that is speculated evidence of UFOs and aliens in the game. 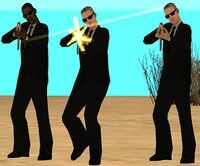 In GTA San Andreas they appear with two different agents. One with light skin, black suit and tie, gray hair, and dark sunglasses. The other agent has dark skin, a black suit with a black tie, black hair and mustache, and black sunglasses also this agent never talks to Carl unlike the other one. These two could be a reference to the film Men In Black, or Rockstar Games placed them there to go along with the alien theme out in the desert. For vehicles and weapons they differ in each game. In GTA Vice City they have various weapons. In GTA San Andreas they have AK-47s along with the Micro Uzi. Vehicles for them are a special black Maverick and a black Bobcat. In 2008, the setting of GTA IV, the CIA make and appearance as United Liberty Paper. CIA logos can frequently be seen on their diplomas, and in GTA IV's internal files, the UL Paper missions are marked as "CIA". The CIA do not return as a law enforcement agency, however. In Grand Theft Auto V, the IAA is a government intelligence agency based on the CIA. FIB agent Steve Haines holds a grudge against the Agency, and employs fellow FIB Agent Dave Norton, Michael De Santa, Trevor Philips, and Franklin Clinton in attempts to hinder the IAA and secure more funding for the FIB. In almost all of their appearances, the CIA wear black clothing and drive black vehicles. Internal files in GTA Vice City show that the m\names of the character models of the CIA are bga (bodyguard a), and bgb (bodyguard b). The CIA's behavior in GTA Vice City and GTA San Andreas with doing drug deals with gangs is a reference to real-life scandals in the CIA during the mid-to-late 20th century and early 21st century. The CIA would frequently work with drug lords in order for evidence to fight communist guerrillas, in exchange for immunity to prosecution. Also, the CIA helped street gangs distribute crack cocaine, especially in black communities such those in Los Angeles, Oakland, and New York City. This page was last modified on 6 May 2014, at 20:55.